Above photo: From Trade Union Freedom. The first round of the Trump administration’s NAFTA renegotiations began in Washington wrapped up on Saturday. The negotiators will meet again in September in Mexico City and then again in October in Canada. The United States has not yet proposed any specific measures on important issues such as labor rights, currency manipulation, or rules of origin. By all accounts, these negotiations are more likely to hurt than help most working Americans, who would be better served by efforts to target countries with large, global trade surpluses such as China, the European Union (EU) and Japan. Rather than tinkering around the edges of NAFTA, the United States should begin a campaign to realign the U.S. dollar and rebalance global trade. Over its first 20 years, growing trade deficits with Mexico and Canada from the North American Free Trade Agreement (NAFTA) eliminated 850,000 U.S. jobs, most of them in manufacturing. (American workers suffered far more after China entered the World Trade Organization in 2001, including 3.4 million jobs lost through 2015 alone, due to growing trade deficits with that country.) And trade deficits and job losses are just the tip of the iceberg of the devastation wreaked by bad trade deals, which have also driven down the wages of all 100 million American workers without a college degree, who have suffered losses of just under $2,000 per year for each median wage, full-time worker. Roughly $200 billion per year is being taken from the pockets of working people and middle class families, because the super-rich and huge corporations have been able to game the system at their expense. NAFTA has created the economic equivalent of a 14-lane freeway to Mexico, paving the way for the outsourcing of jobs and factories to Mexico. In the past twenty years, the U.S. has lost more than 87,000 factories (manufacturing establishments), wiping out nearly one-third of U.S. manufacturing production capacity. Tweaking NAFTA around the edges is not going to change those dynamics. As EPI founder Jeff Faux recently explained, NAFTA created “radical new rules for trade…that shifted the benefits of expanding trade to investors and the costs to workers.” The system that created this deal to benefit rich executives and multinational companies is still in place and if anything, tilts even further in their interest in an administration lead by former Goldman Sachs executives Gary Cohn (Trump’s chief economic advisor) and Treasury Secretary Steve Mnuchin. Trade and investment deals like NAFTA provide U.S. corporations with privileged access to the labor markets of poor countries like Mexico and China, with special rules providing extended intellectual property rights—opening markets to private investors in service activities ranging from banking and telecommunications to water and public education, enforced by investor-state dispute resolution panels that operate entirely outside of national court systems. U.S. Trade Representative Robert E. Lighthizer has put forth negotiating objectives that are designed to expand benefits of trade for foreign investors, strenghten intellectual property rights, and update NAFTA rules to facilitate digital trade in goods and services, small business access, and government procurement. Far from the administration’s stated goal of bringing jobs back to the United States, these moves will, if anything, make it easier for companies to send jobs abroad. The administration also seeks to incorporate labor and environmental standards in the core of the agreement. But NAFTA is and will remain an agreement designed to encourage firms to outsource production to Mexico, and to shift income from wages to profits. Improving labor and environmental standards in Mexico is not likely to shrink the gap between wages in the United States and Mexico to any appreciable extent, nor will it eliminate the U.S. trade deficit with Mexico or Canada. According to The Conference Board, hourly manufacturing compensation costs in the United States exceeded those in Mexico by more than 6-to-1 in 1997, and by roughly the same margin in 2015—there has been no significant change in the wage gap in the NAFTA era. Even if wages in Mexico were doubled through implementation of more effective labor standards (and assuming U.S. wages were unchanged), there would still be a wage gap of more than 3-to-1—providing huge incentives for firms to maintain and increase outsourcing of U.S. manufacturing to Mexico. The only public policy that could support balanced trade with Mexico is a European-style, European Community expansion policy mix (employed when Greece, Spain, and Portugal entered the EC in the 1980s) which provided greatly increased development funds designed to bring about a fundamental increase in wages and incomes in those countries prior to their joining the EC (which subsequently became the European Union). The United States can and should invest heavily in economic development in Mexico, which would be good for workers in both countries, but that is a development policy proposal designed to narrow incentives to offshore production to Mexico while raising demand in Mexico for exports of U.S. consumer goods. Trade policy alone cannot achieve these goals. For these reasons, the costs of renegotiating NAFTA are likely to exceed its benefits. If patents and copyrights are more tightly enforced, for example, then the profits of big-pharma, software giants, and Hollywood will rise, but this will leave workers in Mexico poorer and will likely result in a decline in U.S. exports of manufactured goods to Mexico. So, even if the trade balance with NAFTA improves, these policies will likely harm U.S. manufacturing, costing more jobs and putting more pressure on workers’ wages. On the other hand, NAFTA has fundamentally changed the structure of the North American economy. Multinational companies have built complex, integrated supply chains in sectors like automotive production. Parts often cross borders between the United States, Mexico, and Canada multiple times before a final product rolls off the assembly line. President Trump threatened to tear up the agreement in April, but was convinced by his own cabinet members that ending NAFTA would be too costly to the economy. Hence, negotiators are more likely to end up “tweaking a few provisions and … chapters” of the agreement, precisely what Lighthizer said “he is notinterested in” doing [emphasis added]. What should be done on trade? The most pressing trade problem facing the United States today is currency misalignment and dollar overvaluation. 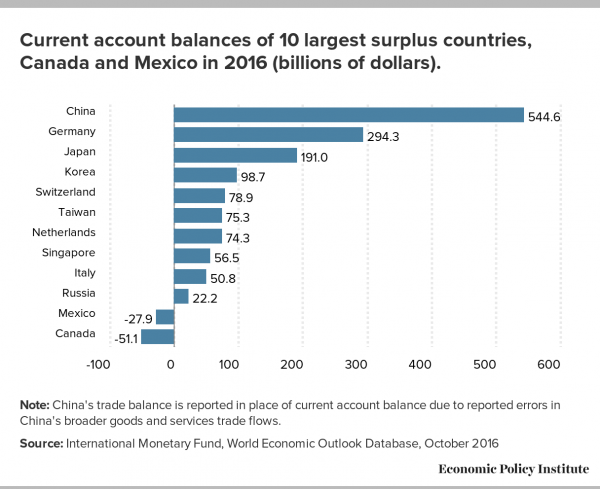 Rather than renegotiating NAFTA, the United States should implement policies that are designed to rebalance trade with China, the EU, Japan and other currency manipulators, which have the largest global trade surpluses in the world, as shown in the figure below. It is important to note that both Mexico and Canada have global trade deficits, and are not contributing to global trade imbalances. Currency misalignment is a measure of how much the dollar must adjust in order to rebalance U.S. trade. The best estimates are that the value of the dollar must fall at least 25 to 30 percent. This must include a substantial revaluation in the value of the currencies of leading surplus countries of 28.6 percent to 47.5 percent (based on Bergsten, C. Fred (2016), Tables 14.4 and 14.5, adjusted for recent dollar appreciation). There are several broad, powerful tools that could be used to realign the U.S. dollar and rebalance global trade including Countervailing Currency Intervention (CCI), where the United States purchases foreign assets to offset any foreign government purchases of U.S. assets, and Market Access Charges (MAC), which would tax inflows of foreign capital that bid up the value of the U.S. dollar. The threat of large tariff increases can also be used to encourage countries to participate in major currency realignments. The United States has engaged in two major currency realignments within the past fifty years, and in both cases, realignment was achieved when large tariffs were threatened or actually imposed (temporarily). In August 1971, President Nixon abandoned the gold standard and imposed a 10 percent across the board import surcharge. His administration subsequently convinced major trade partners to revalue their currencies and remove trade barriers, and the import surcharge was removed four months later. In 1985, in response to a major surge in imports and widespread manufacturing job losses, the House of Representatives on two occasions passed a bill that would have imposed a 25 percent surcharge on imports from countries such as Japan, Brazil, Korea, and Taiwan that maintained large trade surpluses with the United States. The Gephardt-Rostenkowski “Trade Emergency and Export Promotion Act” (H.R. 3035) passed the House twice in late summer and fall of 1985. On September 22, 1985, Treasury Secretary James Baker announced that the United States had reached a “Plaza Accord” with other members of the G-5 finance ministers, which resulted in a 29 percent decline in the value of the U.S. dollar between 1985 and 1991. Congress and the president should strongly consider adopting (or threatening to adopt) large, across the board tariffs on countries with large global trade surpluses in order to persuade them to engage in a coordinated effort to reduce the value of dollar by revaluing their currencies, in order to rebalance global trade. The administration should also implement other policies, including CCI and MAC, to maintain the dollar at a level that is consistent with balanced global trade. These policies are needed to make good on the president’s commitments to rebalance trade and rebuild manufacturing.